The world’s first baby from three parents is here. Dr Zhang did not save a life. Rather, he created one, in a completely new way. News broke this week that the first “three-parent” baby had been born. But the untested and controversial nature of the procedure that created the child, and the end run around public policy that it entailed, raise many more questions than answers. Combining reproductive tourism with high-risk experimental science, a New York-based American doctor, John Zhang, took a Jordanian couple, who wish to remain anonymous, to Mexico, in order to avoid U.S. oversight. The baby’s birth occurred on April 6, and was reported by New Scientist on September 27. First, let us hope the child is and remains as healthy as the announcement says he is. There are, however, reasons to be concerned. This happened in Mexico because, said Zhang, there are “no rules” there. It may not be technically illegal in the U.S. unless public funds are involved, but Congress has blocked the Food and Drug Administration from authorizing clinical trials. The FDA itself considered the safety of the procedure in 2014 and decided then that “there is not enough data either in animals or in vitro to move on to humans”. As David King from Human Genetics Alert has noted, “It is outrageous that (Zhang and team) simply ignored regulators and went to Mexico, because they think they know better”. The UK did recently approve a similar procedure to Zhang’s; as far as is known, he never applied for a license there. 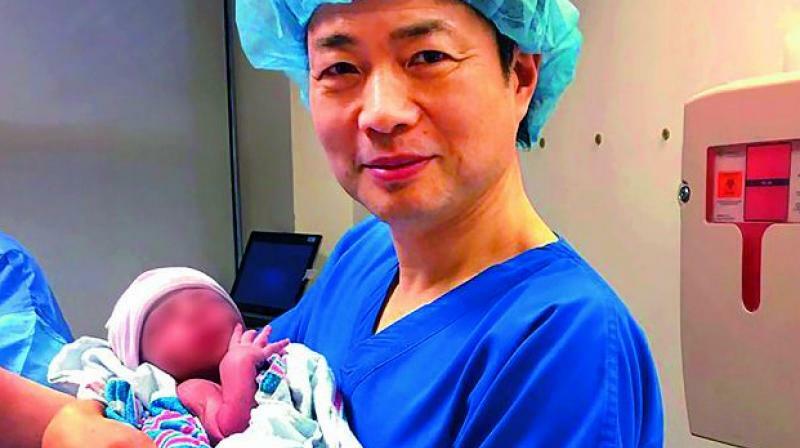 Zhang had, in 2003, made a similar effort in China but authorities there banned the process after his failure: The twins died in premature childbirth. In the present case, the parents had difficulty conceiving a healthy baby because about a quarter of the mother’s mitochondrial DNA (mtDNA) has a harmful mutation. While the mother’s mtDNA is only a tiny fraction of her total DNA, the 37 genes involved are vital to cellular function, and are always inherited from the mother. A technological solution is to find a way of using someone else’s mtDNA. The approach Zhang took is very similar to cloning: The nucleus of a donated egg was removed, and replaced by the nucleus of an egg from the intended mother. This was then fertilised by injection of sperm, and developed into a blastocyst, the precursor to an embryo, that was ultimately moved into the mother’s womb. Of course, it wasn’t straightforward. The fertility doctor created five blastocysts, but only one was viable. (That would be unsurprising for cloning, which has very low success rates.) One did not develop at all and three had chromosomal or genetic abnormalities. The pregnancy was uneventful; the baby was born at 37 weeks, a little early but within normal range. He does have a little of his mother’s mtDNA (less than 1.60 ± 0.92%) but seems healthy. These data are from what is either a long abstract or a very skimpy article in Fertility and Sterility, available online and due to be published on October 19. That date coincides with the annual meet of the American Society for Reproductive Medicine, at which we may learn more. The baby exists, and deserves privacy. But for reasons both of his own health and of science, it is vital that he be monitored closely, and permanently. There is speculation, for instance, that different kinds of mtDNA may replicate at different rates, so the 2 per cent he has that could cause disease might rise to a worrying proportion. There is a real chance he could eventually develop life-threatening conditions. He seems healthy now, we hear, but that surprises experts. Developmental biologist Stuart Newman noted: “Recombining portions of the damaged egg cells of two different women has not been encountered in the evolutionary history of our species.” He also suggests subsequent development may produce abnormalities — the process is complicated and outcome, uncertain. What we now know for certain is that national regulations without international cooperation may be almost useless in today’s interconnected world. Meanwhile, gene-editing technology is advancing rapidly, and many, but not all, governments are involved in creating new rules for applications that do not yet exist. Among the most worrying possibilities are the creation of children with genetic modifications that could change forever what it means to be human. “Designer babies”, for short. The future of humanity just took on a new and worrying aspect.